Apple announces iPhone 8 and iPhone 8 Plus with A11 Bionic chip and Wireless charging. Apple today announced a new generation of iPhone: iPhone 8 and iPhone 8 Plus. The new iPhone features a new glass and aluminum design in three beautiful colors made out of the most durable glass ever in a smartphone, Retina HD displays and A11 Bionic chip, and is designed for the ultimate augmented reality experience. The world's most popular camera gets even better with single and dual cameras featuring Portrait Lighting on iPhone 8 Plus, and wireless charging brings a powerful new capability to iPhone. iPhone 8 and iPhone 8 Plus introduce a beautiful glass back design made with the most durable glass ever in a smartphone in three new finishes: space gray, silver and gold. The glass finish is made using a seven-layer color process for precise hue and opacity, delivering a rich depth of color with a color-matched aerospace-grade aluminum bezel, and is water and dust resistant. The camera is even better on iPhone 8 and iPhone 8 Plus, featuring an improved 12-megapixel camera with a larger and faster sensor, a new color filter and deeper pixels. A new Apple-designed image signal processor delivers advanced pixel processing, wide color capture, faster autofocus in low light and better HDR photos, while a new quad LED True Tone Flash with Slow Sync results in more uniformly lit backgrounds and foregrounds. iPhone 8 Plus features dual 12-megapixel cameras and introduces Portrait mode with Portrait Lighting, bringing dramatic studio lighting effects to iPhone, allowing customers to capture stunning portraits with a shallow depth-of-field effect in five different lighting styles. Portrait Lighting uses the dual cameras and the Apple-designed image signal processor to recognize the scene, create a depth map and separate the subject from the background. Machine learning is then used to create facial landmarks and add lighting over contours of the face, all happening in real time, giving customers even more power to express themselves through photography. The glass back design on iPhone 8 and iPhone 8 Plus enable a world-class wireless charging solution. Wireless charging works with the established Qi ecosystem, including two new wireless charging mats from Belkin and mophie, available from apple.com and Apple Stores. + iPhone 8 and iPhone 8 Plus will be available in space gray, silver and an all-new gold finish in increased 64GB and 256GB capacity models starting at $699 (US) from apple.com and Apple Stores and is also available through Apple Authorized Resellers and select carriers (prices may vary). + Through Apple's iPhone Upgrade Program, customers in the US can get iPhone 8 and iPhone 8 Plus, with the protection of AppleCare+, choose their carrier (no multiyear service contract required) and have the opportunity to upgrade to a new iPhone every year. The iPhone Upgrade Program is available for iPhone 8 and iPhone 8 Plus at apple.com and Apple Stores in the US with monthly payments starting at $34.50 for iPhone 8 and $39.50 for iPhone 8 Plus. 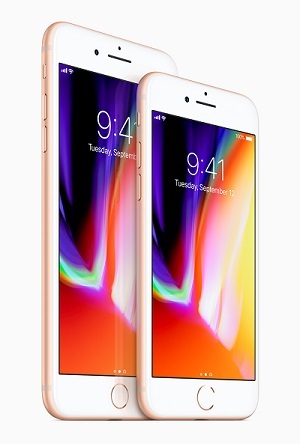 + Customers will be able to order iPhone 8 and iPhone 8 Plus beginning Friday, September 15, with availability beginning Friday, September 22, in Australia, Austria, Belgium, Canada, China, Denmark, Finland, France, Germany, Hong Kong, Ireland, Italy, Japan, Luxembourg, Mexico, Netherlands, New Zealand, Norway, Portugal, Puerto Rico, Singapore, Spain, Sweden, Switzerland, Taiwan, UAE, the UK, the US and US Virgin Islands. + iPhone 8 and iPhone 8 Plus will be available in Andorra, Bahrain, Bulgaria, Croatia, Cyprus, Czech Republic, Estonia, Greece, Greenland, Guernsey, Hungary, Iceland, India, Isle of Man, Israel, Jersey, Kuwait, Latvia, Liechtenstein, Lithuania, Malta, Monaco, Poland, Qatar, Romania, Russia, Saudi Arabia, Slovakia and Slovenia beginning Friday, September 29.